It can be tough to eat out as a vegetarian. Not that I have any authority to talk on the matter, of course. If left to my own devices, I can be ferociously carnivorous. I recently discovered a restaurant that offers chicken wings ON steak. I've yet to convince anyone of its glory, but let me assure you it's the business. Despite this, I find myself a bit of a fair-weather vegetarian at the moment, at home anyway. This is mostly down to the people I live with, two of whom are veggie. So it's just easier to go with the flow, and devour steak after steak when they're gone. But when we're out for dinner, or I'm with another vegetarian, I often feel bad for them. In Ireland especially (or maybe in the North West) there are often plenty of great meaty options, but nothing too inspiring for them. Usually it's some kind of pasta, or stir fry. In short, something that can be thrown together in the kitchen without any hassle. This isn't the case in Brighton, land of the vegetarians. I'd often heard good things about Terre á Terre, the vegetarian restaurant in the Laines. I'd wanted to go for a while, but never quite gotten around to it. So when I was over recently for the festivals, I was happy to head along for dinner. And, I'm happy to say, it was one of those meals that sticks around in your mind. You know when you eat something so delicious, you can't bear not having it in your weekly repertoire? That's what happened with a few things here. 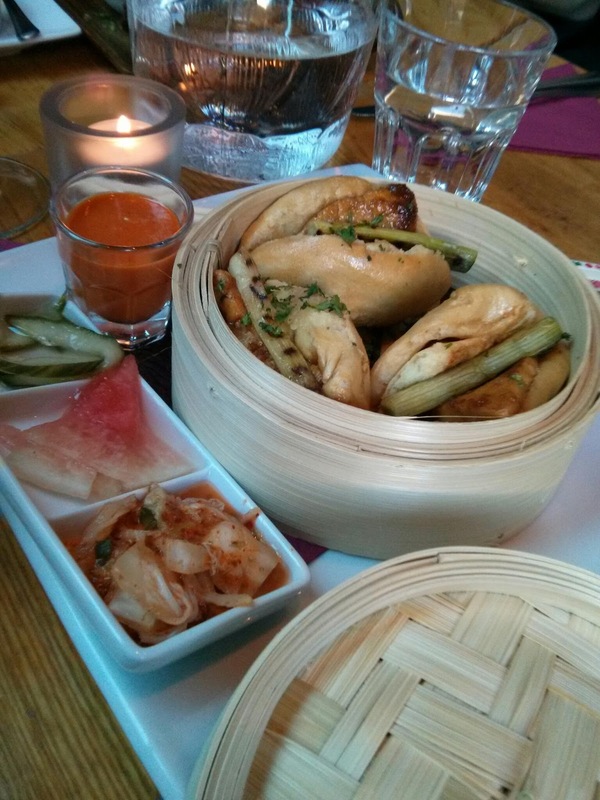 To start, we had a selection of the starters, the best being the rice buns pictures above. A smooth, light dough encircled marinated halloumi, and it is KILLING me not to be eating them now. I can't even find a recipe close enough to them, but oh, they were good. There were also a fine selection of cocktails and wines, perfect for the summery evening. 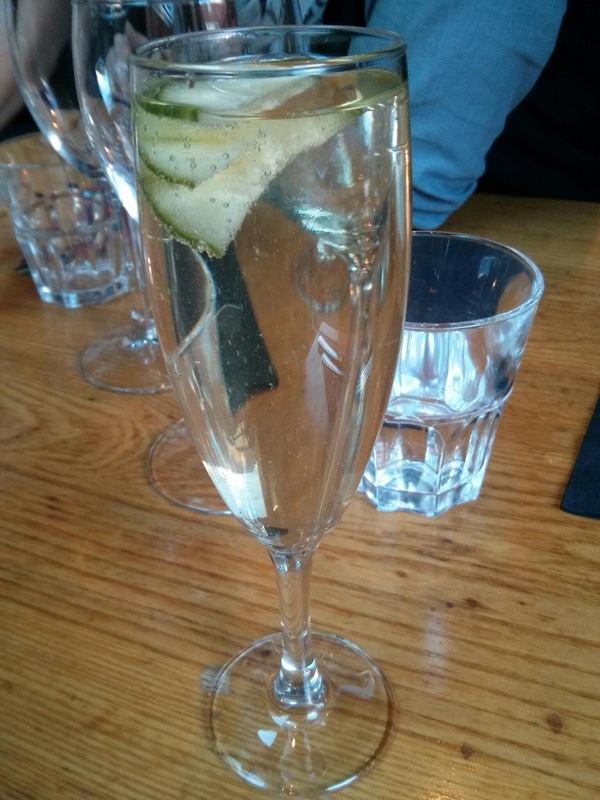 I had an elderflower/champagne cocktail with cucumber, which was pure summer in a glass. My main was one of those dishes that looks, in retrospect, like it's trying too hard to be something it's not. In general, I loathe vegan/"healthy" versions of dishes that need no messing with. Calling something a chocolate mousse only works if it's a chocolate mousse. If it's made from avocado and cacao, then sure, it can be gorgeous. But give it a different name, for the love of Mike. You're just messing with expectation. It was only when my dish arrived that I realised it was a take on fish and chips. The halloumi (can you sense a theme here?) 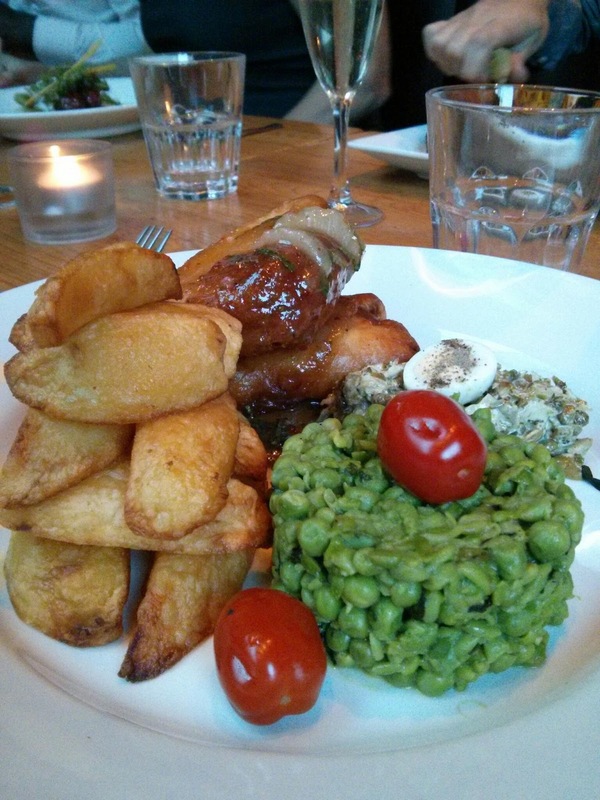 was marinated in buttermilk and fried in batter, served with thick chips and minted pea hash. It's an awful picture below, I admit. But I was just desperate to eat the thing, and very aware that taking pictures of food is rude and annoying to everyone involved. It was a beaut, though. There was a mountain of halloumi, with a bittersweet glaze, and tiny quails's eggs on the side. The peas were perfectly crushed, and the chips fluffy yet crisp. There was no time for dessert, but I did get to taste some divine truffles, which are sold at the front of the restaurant. The next time I go, I'll be sure to try their churros. Price wise? It's fairly middle of the road, depending on how gluttonous you want to be. A small portion of the 'Peeking Buns' as a starter is £8.95, and the mains are around £14.95, which is great value. When I was in, they were offering a set menu, with three courses for £25. This seems to be a rotating deal, and works out at a really good price. What makes Terre á Terre succeed in my book is that you forget, pretty quickly, that you're in a vegetarian restaurant. You just eat a fabulous meal, and leave feeling happily full, without wondering where your big hunk of meat got to. This pizzas seemed to be a lot of the thinest crust I've ever sampled restaurants in newhaven . This was correct Neapolitan pizzas.